Elegant and inspired by traditional crafting, the Khayma Farrago rug collection has a tribal patchwork appearance. This range by Louis de Poortere incorporates traditional patterns with modern, neutral colourways making it easy to incorporate into rooms of many assorted designs. The gentle colour palette used in the Khayma rug design has an almost vintage feel and it’s low flatweave pile of just 3mm means it can easily be positioned under furniture as well as centrally within any room. 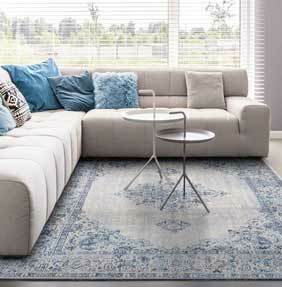 Each rug is made from high quality Jacquard Cotton with a latex backing to keep it in place. There are a choice of different sizes available to suit any modern room.